8 Grade Washington DC Trip! The annoying ring of your alarm goes off at 2:00 AM, on Saturday, March 30, you are headed to Washington DC. You roll out of bed, put your phone charger in your carry on, and head out the door. When you get to school, you see a bus filled with all your closest friends. Your face turns red from embarrassment as your parents hug you goodbye and you’re off, headed to LAX.The long plane ride is filled with kids sleeping and chaperones regretting volunteering. When the plane lands, you head on a bus to the Roosevelt and the Martin Luther King Jr. Memorial. You couldn't be happier as you head to dinner shortly after because you haven't eaten since the plane! So, you laugh at Corner Bakery while eating some really good chocolate chip cookies. Then, the moment comes, your first look at your very own hotel room. As all the kids swipe their room card, you can hear the tv's turning on and kids busting out their snacks. The challenge begins: which room has the most snacks? One girl's room makes a snack drawer while the boys sprawl out all their sugar on their table. You finally fall asleep only to be woken up again by the sound of the phone ringing for the morning call. Everyone sleep-walks into breakfast on their first day. The chaperones prepare for their first long day by emptying out the coffee machine, and you are back on the bus to Mount Vernon, George Washington's home. After an early morning, you are excited to see the pizza and pasta presented to you at lunch. 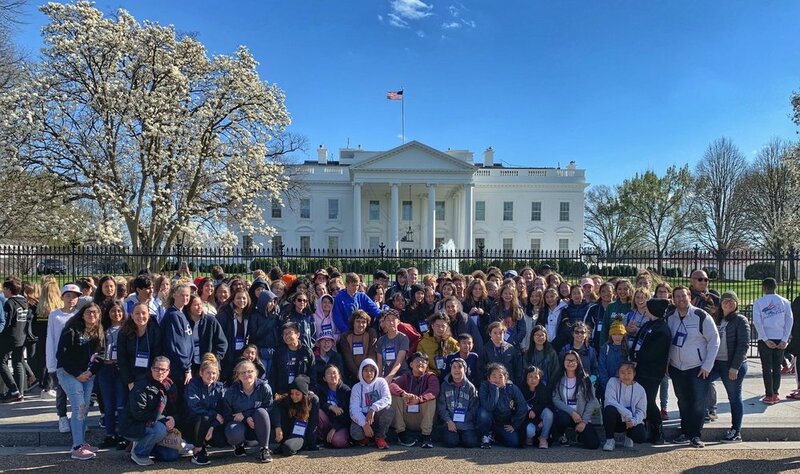 Before you know it, you are back on the bus heading to the Newseum and a picture stop at the White House. The day ends with the World War II and Jefferson Memorial. You eat then sleep, then wake up again for another full day of activities. One of the most jam-packed days was a day that started early with a two-hour bus ride to the University of Virginia where you took a quick tour then headed to everyone's favorite lunch spot, Michie's Tavern! Here, students enjoyed the best-fried chicken ever and were stuffed with biscuits and mashed potatoes. From there, we headed to Monticello, Thomas Jefferson's house. Back on the bus for the ride home! Dinner is served at Georgetown University and then a night tour at the Kennedy Center for Performing Arts. The next day is also an early morning, shocker. We all pile in the bus and head to the Arlington Cemetery where we get to watch the changing of the guard. Next stop is the Pentagon and then the Vietnam Veterans Memorial. Then we head to the Holocaust Memorial Museum and the National Museum of African American History and Culture. We finish off with another night tour of the Korean War Veterans Memorial and the Lincoln Memorial. The last day is no time for relaxing! We head to the Library of Congress and the Portrait Gallery were we saw paintings of all our presidents. Then we head to the Air and Space Museum and the National Museum of Natural History! After all that, we head to the airport where the stress overcomes a few of us. There was a gate change and a lot of time was spent at baggage check. Needless to say, we eventually made it to the terminal with five minutes to spare! All 90 of us were accounted for and we made it home. As we pull into the parking lot at around 1:50 am, it just looks like your average Monday morning at school, a lot of tired kids that just want to go home and sleep. Nonetheless, everyone had a great time and good jobs to the chaperones for keeping us all in check! All the eighth graders at the White House!